Passed away one year ago today. 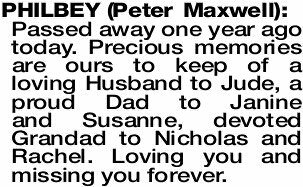 Precious memories are ours to keep of a loving Husband to Jude, a proud Dad to Janine and Susanne, devoted Grandad to Nicholas and Rachel. Loving you and missing you forever.